Pictured during the presentation of a Proclamation by the City Of Oswego declaring June 13-19 â€œSt. Luke Health Services Weekâ€, in honor of the healthcare organizationâ€™s thirty-fifth anniversary of serving the community are, (standing left to right) Mayor Randy Bateman; and St. Luke Health Services Assistant Administrator Cathy Gill. Seated (left to right) displaying the Proclamation are St. Luke Resident Council members Mary Flack; Peg Bull and Jean Zeno.Pictured during the presentation of a Proclamation by the City Of Oswego declaring June 13-19 â€œSt. Luke Health Services Weekâ€, in honor of the healthcare organizationâ€™s thirty-fifth anniversary of serving the community are, (standing left to right) Mayor Randy Bateman; and St. Luke Health Services Assistant Administrator Cathy Gill. Seated (left to right) displaying the Proclamation are St. Luke Resident Council members Mary Flack; Peg Bull and Jean Zeno. OSWEGO â€“ During the month of June, St. Luke Health Services is celebrating thirty-five years of caring for the Greater-Oswego County Community. Opened in 1975, the St. Luke organization has provided long term care and rehabilitation services to thousands of county residents and remains one of the largest private employers in the area. City of Oswego Mayor Randy Bateman issues a Proclamation declaring June 13 â€“ 19th â€œSt. Luke Health Services Weekâ€; acknowledging the contributions the St. Luke organization has made, and the important role those residing at St. Luke have had in the history of this community. 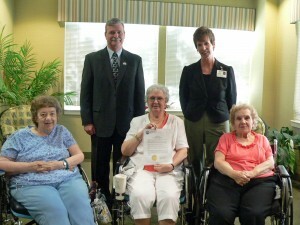 City of Oswego Mayor Randy Bateman made a visit to the St. Luke healthcare campus to personally present the Proclamation to representatives of the St. Luke Health Services Resident Council.